Professor Butler has a Ph.D. in Literary and Cultural Studies. 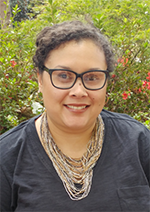 She is Assistant Professor of African American Literature, teaches in the Africana Studies Minor, and is affiliated faculty with Women’s and Gender Studies. Her main areas of interest are Africana Women’s Literature, Anglophone Postcolonial Literature and Theory, and Literary Feminisms. She has work under review on representations of digital diaspora in Chimamanda Ngozi Adichie’s Americanah, and on teaching Edwidge Danticat’s Create Dangerously: The Immigrant Artist at Work. Her current project is a monograph about postnationalisms in the work of contemporary African Women Writers. She is the co-founding Vice President of the Edwidge Danticat Society, and is the founder and moderator of a vibrant online #AcWri community serving underrepresented and traditionally marginalized scholars. Eds. Butler, Maia, Joanna C. Davis-McElligatt, and Megan Feifer. Narrating History, Home, and Nation: Critical Essays on Edwidge Danticat. Forthcoming, University Press of Mississippi. “The Exigency of the Floating Homeland and Engaging Postnationalisms in the Classroom: Approaches to Teaching Edwidge Danticat’s Create Dangerously: The Immigrant Artist at Work.” Critical Approaches to Teaching Edwidge Danticat. Eds. Joseph Celucien, et al. Forthcoming, Routledge Press. “Visioning Black Futures: Edwidge Danticat as Cultural Worker.” American Literature Association Conference: San Francisco, California. May 2018. Roundtable Presentation with Dr. Andrea Roberts. Paper: "Pushing the Limitations and Possibilities of Home: Racial Negotiations and Syncretic Epistemologies in Toni Morrison’s Paradise." Panel: “Looking for the ‘Black Fantastic’ in Diasporic Geographies and the Literary Imagination.” Black Communities Conference. Durham, NC. April 2018. Workshop Facilitation with Dr. Sabrina Cherry and Dr. Yarneccia Dyson: “What I Wish I Knew: Navigating the Terrain from Dissertation Defense to Year 1 of Faculty Appointment.” Faculty Women of Color in the Academy Conference. Blacksburg, Virginia. April 2018. "Creative Transnationalisms: Floating Homeland as Postnational Community in Edwidge Danticat’s Create Dangerously.” American Literature Association: San Francisco, California. May 2016. “Imagining Countries, Re-memorying Homes: Displacement and Unhomeliness in NoViolet Bulawayo’s We Need New Names.” Multi-Ethnic Literatures of the United States (MELUS): Athens, Georgia. April 2015. “Blogging Race, Blogging Nation: Discursive Construction of Home in Chimamanda Ngozi Adichie’s Americanah.” South Atlantic MLA Conference: Atlanta, Georgia. November 2014.